It’s been a busy quarter for the Moz Content team, and we’re excited to share the results of our hard work! During the first few months after launch, we focused most of our energy on improving the Content Audit workflow with a few stability- and speed-related updates sprinkled in. This quarter we’ve had the opportunity to explore exciting ideas that create unique insights for you, our awesome users! These are the first (but definitely not the last) round of innovative additions for the year. I want to see these updates in action! One of the more challenging aspects of building and executing on a content strategy is the ideation phase. The proverbial question of “what should I write next?” is a constant theme in our customer and industry feedback. That’s why we’ve focused a majority of our efforts on taking the pain out of content ideation. Last quarter we received a fair amount of feedback referencing confusion with the timeframe selection in Tracked Audits. We also weren’t happy with the level of interaction users had with the visualizations. With that feedback, we overhauled the entire experience to allow you the ability to drill down into specific time segments. This becomes powerful when comparing performance of a site over, say, the previous quarter or month. You also now have the flexibility to toggle visibility of the data you care about. Don’t care about Pinterest shares of your content? Great — go ahead and toggle that off with a single click in the graph legend. Ideation can be a huge challenge when consistently working to produce relevant and timely content for your audience. The new related topics feature in Content Search shows you topics your competitors are writing about that you may have missed or ignored. When ideating, this can provide a set of unique, relevant, and potentially high-performing topics to seed new ideas. Each article has topics we’ve extracted from the page content. When you perform a Content Search, we run an aggregation over said extracted topics that takes into account publication date and Reach score to generate a list of the most relevant Related Topics for your query. Example: Our team loves pizza, so we’re often interested in the latest pizza news. Performing a search for “pizza” articles in the last month produces what we believed to be an erroneous related keyword seen below (mount kilimanjaro). Mount Kilimanjaro?! All it took was one click to realize that no, this was no mistake: Pizza Hut delivered a pizza to the top of Mt. Kilimanjaro. The team has to know about this! And that, my friends, is why you should all be using the Related Topics feature. When you’re comparing content performance against the competition, it’s not always as simple as looking at one brand or website versus your own. It’s often the case that you’re competing for viewership with many websites that bleed in and out of your primary industry or vertical. That’s why we’ve introduced a new comparison tool in our search results. We now show you how a piece of content performs relative to similar results in our search index. Oh, and how about those Roger emoticons?! We even use them in our Slack channels! With an active Tracked Audit, we crawl your site and discover, measure, and track your content on a weekly basis. Our recently released digest emails take this a step further by providing an indication of when we’ve completed your weekly audit, in addition to some unique highlights (or, in some cases, lowlights) from the past week. 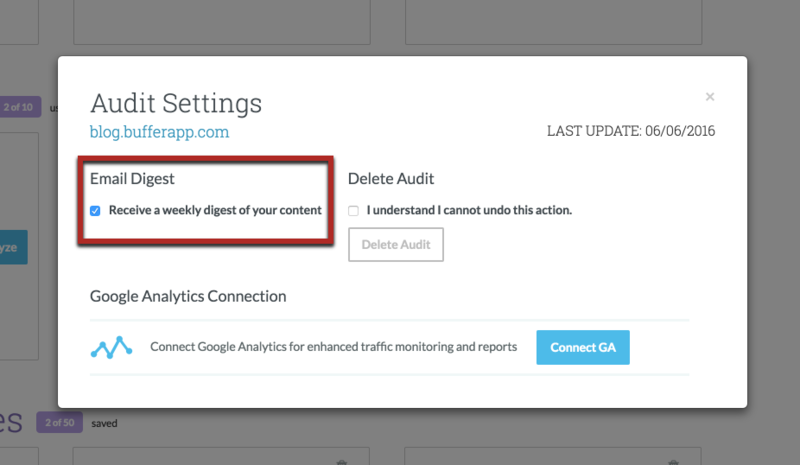 We’ve just enabled weekly digests for all existing Tracked Audits and digests are turned on by default going forward. It’s easy to update your email settings on the Dashboard by selecting the cog icon at the top of an audit tile, or by adjusting your account-level settings at moz.com/email. We know there’s no time to waste when producing awesome content for your audience! That’s why we’ve worked hard to leverage the power of ElasticSearch, an extremely powerful storage utility, which allows us to index and serve many millions of documents in a matter of milliseconds. When we started storing all of this data, we weren’t entirely sure how we’d be using it in the future. As the index grew, we were forced to cap the number of results for a query at around 13k documents due to network limitations. These latest updates to our index now allow access to millions of results and begin to open up interesting new questions. Ready to check out the new-and-improved Moz Content? We hope you’re as excited about these new features as we are. As always, feel free to leave questions, concerns, or ideas in the comments below! We love feedback, and we love incorporating it into the product even more. Huge ups to the team: Greg Burton, Ben Robbins, Chris Whitten, Jay Leary, David O’Hara, and David Him. PS: We’ll all be at a MozCon booth this year, so feel free to drop by and say hello!